In this blog, you’re going to find out who uses Instagram, how to find followers and get like on your photos, and resources and links to more information about marketing. The use of Instagram is simple (and needs to be kept that way). All that you need in your social media arsenal is a mobile device, for example, a mobile phone or a tablet. You can access Instagram from a computer, unfortunately, it hasn’t been developed to the level of depth like Twitter or Facebook; which is odd as it is currently owned by Facebook. Post hyperlinks in your post captions. Although you can’t post hyperlinks to other pages in your captions, as some sort of consolation, you can still post them up in your Profile Bio. We hope one day that this will change however, this doesn’t affect how good Instagram really is. There are a lot of people who use Instagram, which can be used to your advantage. This means tonnes of opportunities for engagement, awareness, and branding. Instagram has created two more apps called Boomerang and Layout. There are lots more apps that are waiting to be used for creating spectacular Instagram posts. Apps like Inshot, Photoshop Mix and Photoshop Express can be used to edit photos and videos to create a great image for you to post online. Within a six-month period in 2016, Instagram grew its daily count by 100 million users. Now with more than 600 million active users its no wonder why it has become so popular. 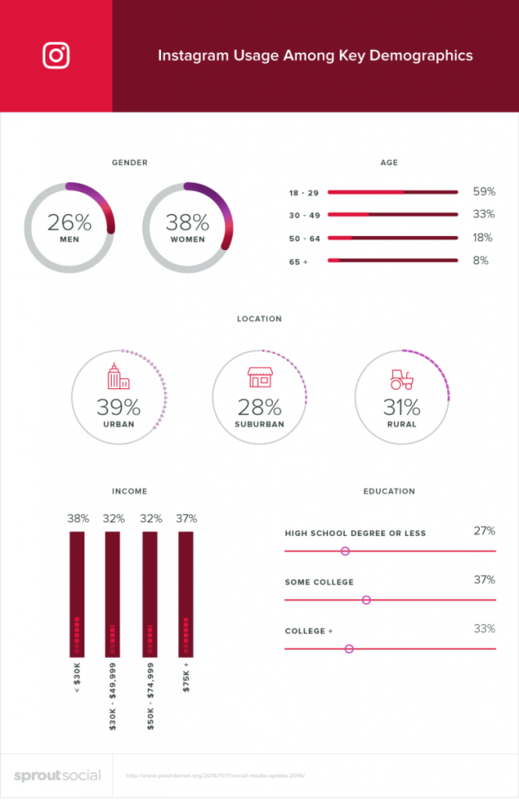 Here are some demographics of the users of Instagram. It is important to understand who uses Instagram. By knowing your audience, you can tailor your account to suit their needs and increase your opportunities. The above stats, however, do not mention anything about under 18-year-olds, but from the age ranges demographics, you can draw a conclusion and predict that the younger you are, the more involved with Instagram you will be. This is of course given that you can understand technology, as newborns can barely talk let alone take a selfie and tag their friends. When making a post on Instagram, there is an option to post hashtags. The hashtag symbol looks similar to a naughts and crosses board ‘#’. It allows the user to type in a key word, which when is searched, will bring up any posts that the word has been has tagged on. For example, if you searched Valentines day, Instagram will bring up images that have “#ValentinesDay” hash tagged in the caption. Advice about hashtags can be mixed. Some people advise that you use hardly any hashtags, some people advise that you use as many as possible (which was 30 hashtags maximum per post), other people say to avoid using the generic hashtags, and there are others who advise using a mixture of the two. With hashtags, it’s all about finding the correct balance to suit your own profile. If you struggling for hashtags, there are many websites that can generate hashtags specifically tailored for your Instagram profile. You usually have to search for a key word which the hashtag generator will use to find other key words. You would then simply copy and paste the hashtags into the caption of your post. You don’t have to post the hashtags in the caption of the image. If you would like to hide the hashtags, you can just post your image with a caption as normal (no hashtags in the caption). Then as soon as you make your post, comment on the image with all of the hashtags that you would like to use. By doing this the hashtags still bring up your post when any of the key words have been searched. Instagram engagement is driven mainly by #Hashtags. You will notice that posts that don’t have hashtags won’t do as well as posts that do have hashtags. Although with this said, you still need to remember the key is to upload engaging content always. The easiest way to find followers is to follow other people, like their photos and comment on their photos. However, before you start to add likes, comments on posts, and follow Instagram users, you need to know your audience. For example, your audience may be into classical music. You will need to make sure you target Classical Music accounts and also use Hashtags with Classical Music keywords; for example “#Classical” “#Piano” “#WindInstrument” “Orchestra” Etc. An author of one article once stated that he gained 6 followers after every 100 likes. 6 followers may not seem like a lot of followers but when you realise how quick it is to like 100 posts, the ratio doesn’t seem so bad. Regardless of the author’s findings, liking and commenting and following accounts on Instagram is one of the easiest ways you can attract engagement. Be consistent by posting the same amount of photos each day at the same time. Use apps like Buffer, Latergramme, Crowdfire and Hootsuite to schedule your posts. Always remember that natural engagement is always the best form of online engagement, regardless of the platform you are using. Paying for followers is also an option that will save lots of time and energy with trying to increase followers and engagement, however, you will have the task of trying to turn that engagement into actual meaningful and organic engagement for your business. Instagram is a powerful tool and a popular networking tool. The simplicity and smoothness of the app makes it a ‘must use’ app out of the social media giants. It provides excellent opportunities for business and is a great way to reach out to the younger generations. Whichever decision that you decide to choose to make your followers and online engagement grow, remember that genuine engagement is the key. Genuine engagement is the best form of engagement possible.